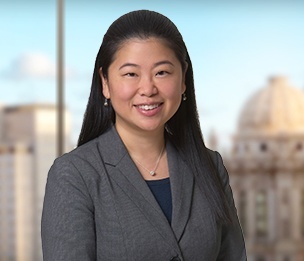 Hellin Jang is an experienced advocate for her clients in all aspects of civil litigation, including bench and jury trials in federal and state courts. Ms. Jang’s broad litigation experience includes representing clients in cases involving personal injury, wrongful death, professional liability, civil rights, employment, administrative review, and class actions. Ms. Jang’s trial skills were honed when she served as an Assistant Attorney General for the Office of the Illinois Attorney General for more than eight years, where she represented the State and its agencies, employees, and judges at all stages of civil disputes, from initial investigation through trial, and in many alternative dispute resolution forums. Prior to working at the Illinois Attorney General’s Office, Ms. Jang also represented various corporate clients, including a Fortune 200 company, which positions her to uniquely represent corporate interests in contract disputes and other contractual issues. While attending Loyola University Chicago School of Law, Ms. Jang served as a Judicial Intern for the Honorable Jack B. Schmetterer of the United States Bankruptcy Court for the Northern District of Illinois, and she conducted criminal trials under Supreme Court Rule 711 while serving as a law clerk for the Cook County State’s Attorney’s Office. Ms. Jang also served as an editor on the International Law Review and the Children’s Legal Rights Journal, was a Central Region Finalist of the Thomas Tang Moot Court Competition, and served as a Moot Court Executive Board Co-Justice for the Loyola Appellate Advocacy Honors Program.